Thank You Courtney from Texas! The sun was brutal. We weren't getting a ride, so we lugged our packs along the unshaded roadside for a better place to hitch. I occasionally poured water on my head for some relief and Red had to stop to put on more layers of sunscreen to counteract his pale skin ginger curse. Thankfully, we were saved by a series of hitches. Two by the same incredibly generous guy named Patrick, and a third by a girl named Mac. 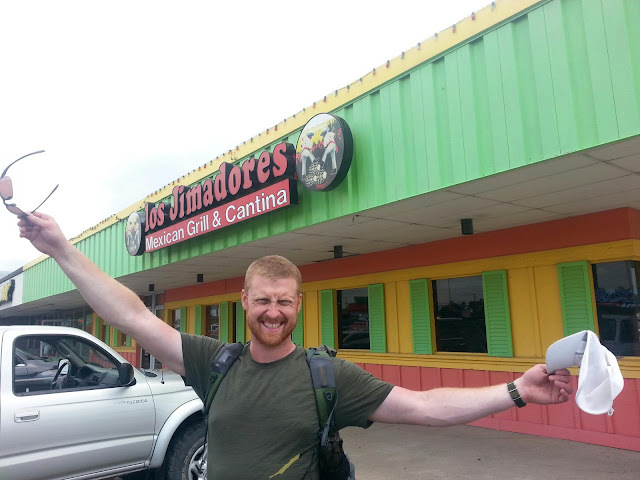 Mac recommended a Mexican restaurant called Los Jimadores, so dropped us off out front. This didn't really fit into our budget, but we needed some time out of the sun. Red and I looked at each other and simultaneously said, "donation money?" We received a donation from Courtney in Texas that we were saving for such a moment. Thank you Courtney, you turned Macon, Missouri into an oasis!